Salmon fly size - how do you choose? There are an amazing multitude of fly patterns and styles to choose from. Some grace the pages of magazines and the internet with accompanying hype as to their effectiveness, many don’t stand the test of time and having served the short term purpose of selling gullible anglers new concoctions and fly tyers expensive and beautifully coloured materials of insignificant value they are quickly forgotten. Meanwhile companies that make flies do everything they can to increase sales by producing ever changing combinations of ingredients to fulfil the fly fishers “don’t have, must have” anxiety. On the other hand Atlantic salmon have existed on the planet as a species largely unchanged for hundreds of thousands of years and they can be caught on a huge variety of flies, lures and baits. Being at the right place at the right time probably presents the best chances of catching one. Should I choose a dressed fly on a single, double or treble hook, or maybe I should pick a tube fly and if so what type of hook should I use in conjunction with it? Does it really matter which of these I choose? Of course there are the endless debates surrounding hook choice and hooking success but putting that controversy aside, are the fish choosy about which is used, I doubt it and I also find it strange that for most species of fish other than salmon the vast majority of anglers use nothing but single hooks the basic design of which has remained the same for at least a couple of thousand years. The salmon river that confronts me is of medium size, perhaps similar to the Esks, Findhorn, or Nith and because the water is up, with a bit of colour and flowing faster than usual I am thinking about a fly a bit larger than I would normally choose and with some colour to help it show up in the stained water. This of course may have to change as I encounter different pools. Personal preferences play a big part in fly selection, in these conditions I like a fly with a gold tinsel body and a bit of orange, yellow or both colours combined in the dressing. Because I have fished and made my own flies for many years I try to make them a simple as possible, generally restricted to three colours but like all fly dressers occasionally with time to spare at the vice I too indulge in fabricating fancier follies that take much longer to produce without producing any more fish for me. Enjoyable perhaps but practically a waste of time when I could have tied three simpler patterns instead of one dandy! The right choice of salmon fly! My “go to” flies for the conditions described are my simplified hair-wing version of Dunkeld or a Gold-bodied Cascade, I choose a size 6 for the streamy water and concentrate on fishing a nice swing from the centre of the current towards the shallow water on my side of the river over depths between 1 and 2 metres but I’m also conscious that fish may be lying in shallower water due to the added concealment given by the colour. If I think that the fly slows too much as it approaches “the dangle” at the end of the swing (or indeed anywhere that the fly fails to imitate escaping prey) I move it by hand-lining or by manipulating the rod to convince any interested fish that it is alive and hopefully induce a take. As the current slows and the river deepens into the belly of the pool I may have to hand-line more or change to a smaller fly because fish have more time to observe it. The middle of the pool is deep and I question whether a fish will see let alone be stimulated by a fly a several metres above. Generally speaking they are not easily moved in deep water; they are difficult to tempt with normal fly fishing tackle in water more than 2 metres deep. 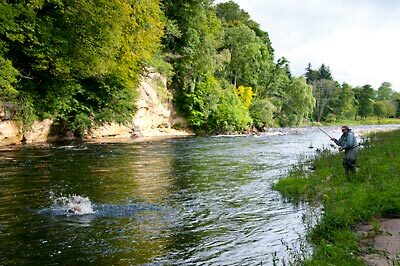 In most cases it is better to concentrate efforts picking out the best taking places and for running fish these are often in water that might be too shallow to be fished when the river is at summer level.